In the mid of the 19th century Sudan governed the territory of Upper-Oubangui, that included present-day Central African Republic. At the end of the century Europeans started to arrive to Africa and establish their protectorates or colonies. 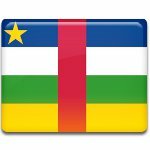 In 1894 France created Ubangi-Shari territory (now CAR). In 1911 France ceded a portion of the territory of Ubangi-Shari to German and annexed it again after the end of World War I. Since 1920 Ubangi-Shari was administered from Brazzaville in French Equatorial Africa. France implemented new laws and introduced mandatory cotton cultivation, that led to usage of force labor. Many Ubangians were dying of illness, exhaustion and poor conditions. In 1957 Barthélémy Boganda, leading nationalist politician, came to power. Within a year he declared establishment of the Central African Republic and served its first Prime Minister. After his death his cousin David Dacko came to power. When the CAR gained formal independence from France in 1960, he became its first President.